You might remember these two beautiful people from their engagement shoot posted here earlier last year. 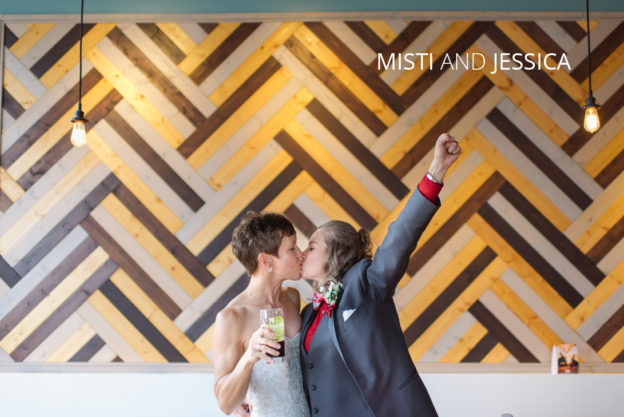 Jess is an OSU super-fan, so when it came to their wedding, the theme was a no-brainer! The entire bridal party wore OSU colors and of course, it wouldn’t have been an OSU wedding without a stop to the shoe for photos during the portrait session. 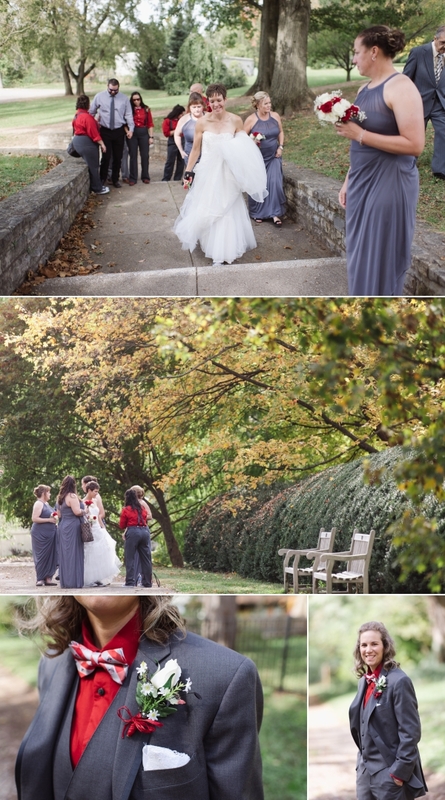 Their day started with a first look on a spectacular fall afternoon at the Whetstone Park of Roses. Their bridal party was so cute- they were all peeking at the interaction from around the corner and couldn’t wait to join them right after! After a huge group hug, it was time for them to walk down the aisle and get hitched. 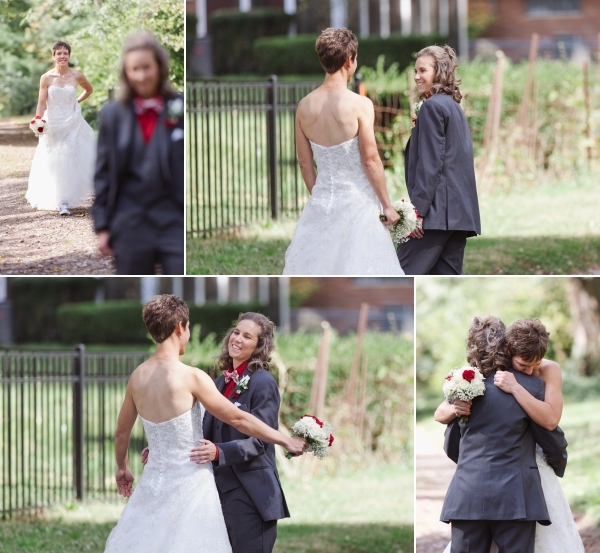 Keeping with the OSU theme, their ring bearer wore an OSU jersey and carried a football. It was beyond cute as he ran and smiled ear-to-ear. 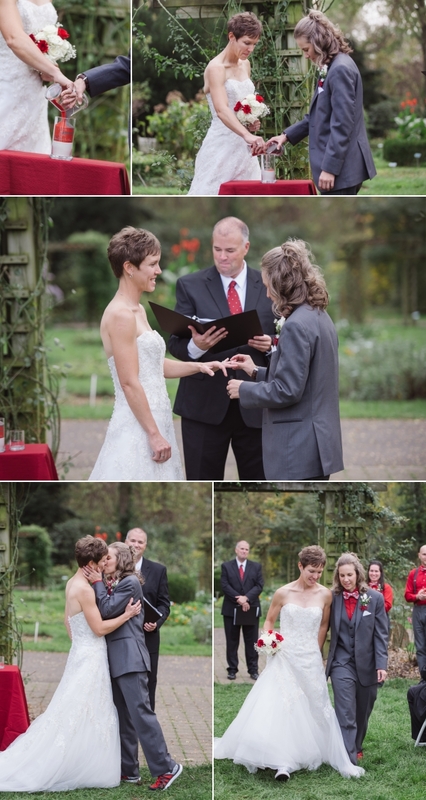 The ceremony was officiated by a mutual friend of the couple and Misti and Jess said their vows in front of tons of family and friends in the scenic rose garden. After a few photos in the park, we made a pit stop down the street at Lineage Brewing so the happy couple could share their first toast as a married couple with their closest friends. Afterward, we ventured to the Horseshoe on the OSU campus for some fun and relaxed photos with everyone. The party ramped up at the Westerville Legion where the OSU campus specialty Adriatico’s pizza was served as part of a tailgate food spread. Sentimental toasts were given to the happy couple and the entire place filled with love and laughter as the open dancing started. Dance moves were incredible and I’ve never seen so many hugs in one night. Everyone was just so happy and I feel so lucky to have been there to experience it. A huge thank you to Misti and Jess for honoring me with being able to spend the day with you both!